In the dance world, every so often there’s a company that truly breaks the mold – but isn’t out for the fame and glory. They work tirelessly to keep creating art, whether they dance for five or five hundred viewers. Arch Contemporary Ballet (ACB) is one such company. Sheena Annalise, founder and choreographer, has a unique vision. Her dancers are right there with her, in a team effort to create work that propels that vision. It can be broken down into three main parts – here described, in no particular order of importance. First, Annalise wants to join ballet and music in fresh, innovative ways. The company has a resident composer, Concetta Abbatte, and resident orchestra. Abbatte composes original music for the company’s original works, and the orchestra plays it live. That’s become a luxury for all too many ballet companies nowadays, with budget constraints leading to issues such as musician layoffs and entire orchestras going on strike. The musicians not only play live but play right on stage with the dancers. They become just as vital to the performances as the dancers. 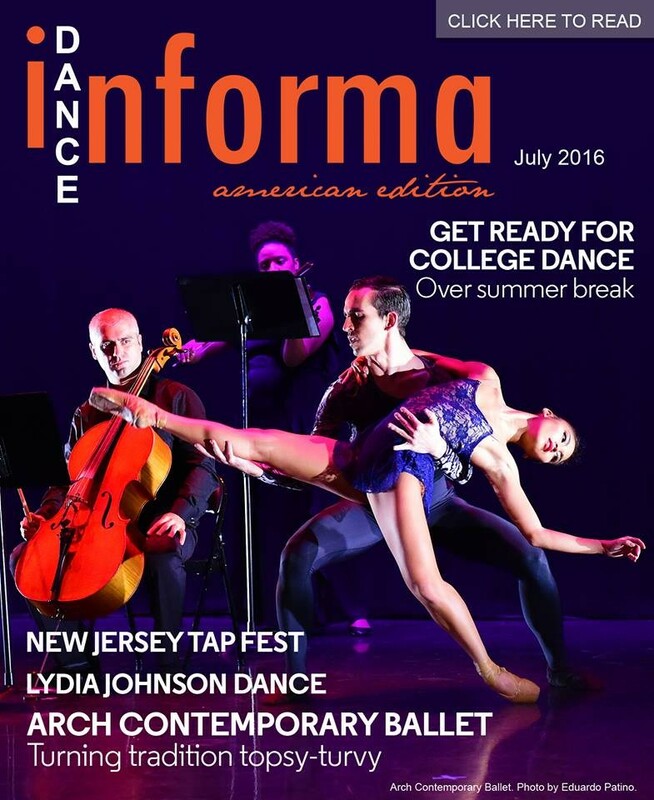 That ties into a second part of ACB’s mission: to shake up the classical ballet tradition. 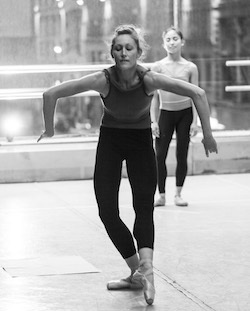 “We’re trying to put dancers, audience and the music on a level playing field,” Annalise explains, “to break boundaries in all aspects of the ballet tradition and hierarchy.” Apart from the described collaborations with musicians, Annalise experiments with things like female partnering and choreographing from dancers’ structured improvisational work. “Most of the time, I don’t go home and make work,” she says. “A lot of the time, I’m creating right there in the spot (in rehearsals).” This breaks apart from how classical ballet is typically created – with choreographers coming in with movement material ready for the dancers to learn. Instead, Annalise and her dancers work together to create new phrasework, she explains. Annalise describes how dancers new to the company are excited to dive into this way of working – unexplored territory for most of them – but that it can be challenging trial-and-error for them. Dancers Melissa Weber, Adrienne Riter and Hope Parker say that they highly enjoy being part of this kind of creative culture. Weber appreciates how because Annalise makes movement phrases on the spot with her dancers, as they can work together to create what really works for their body. Riter loves the feeling of working along with other artists to create fresh, new work. Parker describes feeling empowered from being able to learn and perform aspects of ballet vocabulary that she hasn’t had the opportunity to yet, such as lifting other dancers in partnering (traditionally a male dancer’s role). The company does sometimes portray classical themes, however. Their most recent work, Château, for example, depicts the courts of the French nobility in movement and music. Just as much, however, the company looks to the future in the subject matter of their works. For instance, two years ago, the company premieredProgressive, a work focusing on how technology is always progressing. As one way the piece illustrated this theme, all costumes were 3-D printed. In 2014, 3-D printing was a very new technology. 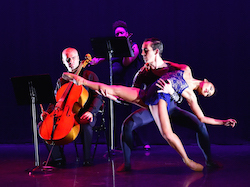 ACB performed the piece at Engadget Expand, a technology conference in New York. “We’re trying to bring art into the technology world, (to) push technology even further,” Annalise explains. The whole company truly works together toward such goals. “Every one of our works is a collaboration – it’s a marriage between the musicians, the dancers and myself,” Annalise affirms. She goes so far as to say that “it’s not just my work”, showing her humble and generous spirit. In that spirit of unity, and as a third part of their mission, they seek to engage and support all types of audiences wherever they perform. “We love to support the development of other towns,” Annalise says, “We’re helping build the community.” That work branches out to commendable charitable initiatives. For instance, ACB is developing a Dance/Movement Therapy program for those of all ages on the Autism spectrum. The company hopes to launch the program in August 2016. Communities seem to sense this support; Annalise describes how the company appears to have bigger fan bases when they tour than they do at home base in New York City! Wherever they perform, Annalise seeks to fill up spaces with movement that she describes as “architectural”, “big” and “whole”. She says this movement uses the body’s natural lines to “enhance the dancers’ positioning in space”. Thus, ACB’s work seeks to fill theatres, big and small alike. In that expansion, the company strives to open up ballet “to all people”, Annalise says. She describes having diverse types of audiences, performing in New York and on tour. That comes back, full-circle, to the idea of stripping away excluding hierarchy from classical ballet – and thus breaking boundaries. At the same time, ACB’s movement pays reverence to the classical vocabulary, while pushing it into new territories. It thus complements, rather than detracts from, the classical ballet tradition. In 2016, audiences and their values often greatly differ from those of the ballet of hundreds of years ago. ACB’s outlook, and resulting creative action, might just be the answer to this beautiful art form surviving for hundreds of years more. 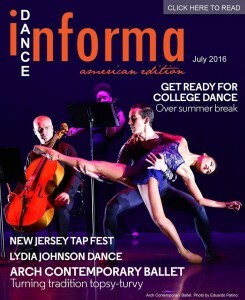 For more information on Arch Contemporary Ballet, visit archballet.com.